Homemade Strawberry Jam will become the star of your breakfast table. You can easily prepare a quick breakfast with it. Butter and jam on toasted bread makes the perfect on the go breakfast. And the recipe is so easy to make. You need only three ingredients. Pictures updated in April 2016. I have been enjoying fresh strawberries since I saw them for the first time this year in an open market here. They didn’t look as red as I expected, so I just thought that they didn’t have any taste, but when I got closer to them, I felt that miraculous scent of strawberries. From then on, I was so fascinated by this scent that I didn’t care if they were inorganic or not. And without any hesitation, I immediately bought 3 pounds, 1 for eating, 2 for making jam. Have you ever made your own jam? It is a great feeling! Seeing that you can make things way better than stores or restaurants will make you feel like a highly experienced chef. Believe me you will feel proud of yourself when you finish pouring your jam in jars. I don’t love jams much but I accept I have a weakness for Homemade Strawberry Jam. I find the store bought versions too sweet and mushy, so I always prefer making it myself. This recipe is a classic one. Almost all jams are made with this method but you might need to play with the measurement of sugar depending on the sweetness of fruit. Before transfering your jam to jars, make sure that they are washed and dried well and have new lids. Otherwise, the surface of your jam might go bad soon. Strawberry jam is my favorite jam and I love it spreading on a slice of bread with a piece of white cheese on top. They together balance their sweetness and salinity and make a great choice of breakfast. Wash the strawberries very well changing the water in the bowl several times. There shouldn’t be any sand or soil left. Cut their stems and put them in a pot. Then add sugar on it. Put its lid on and wait these strawberries for a day. After a day, there should be no sugar, all melted and strawberries should release their juice and should be floating. Now you can take this pot on medium heat and boil it for about 45 minutes. It will get denser.Take the floams with a slotted spoon. You can check if it’s done or not by dropping some on a plate. If it sticks and doesn’t flow easily when you turn the plate upside down, it’s done. Then add lemon juice and bring it to boil a few times. Then you can pour the jam in glass jars and let it cool. This is exactly the way my grandmother used to make her strawberry jam, very sweet 1:1 ratio and leaving the strawberries whole. I have to make it myself this season. Thank you so much Aysegul! We are still learning, you know this is a work in progress. Hope we can get even better. And we’d love to thank you so much for your help! Yummmmm! I LOVE strawberry jam and your photo makes it look so tempting! I’m starting to work on a few jam recipes. So this is a great post for me to be looking at right now. Yummy, I love strawberry jam, and that look delicious. I love jammed Strawberries more than fresh actually. They retain their flavour, but get all squidy. Nice. I found some blackberries in the store the other day and had the same thought as you did – I don’t care that they aren’t in season. They smelled so good! I adore chunky homemade strawberry jam – that looks glorious! YUM! Mix in some cream cheese and spread on a bagle, or just spoon in your mouth! Natasha, Amy Wilson, OysterCulture – Thank you all. Strawberry and cherry are great in breakfast. 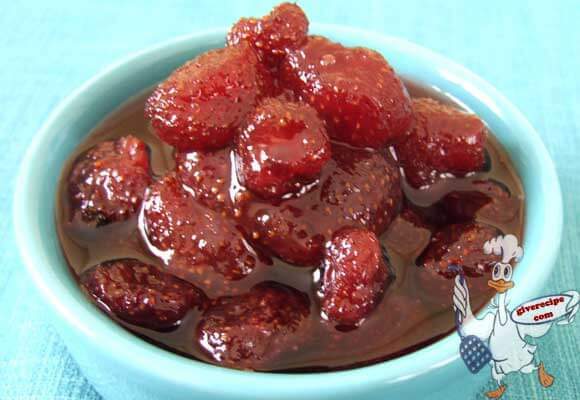 I love strawberry jam – to me that’s a sure sign spring is on the way – hurray! Since I live in California, I see fresh strawberries all the time. I’ll give this a try! Yummy! I love strawberry jam and also cherry preserves!